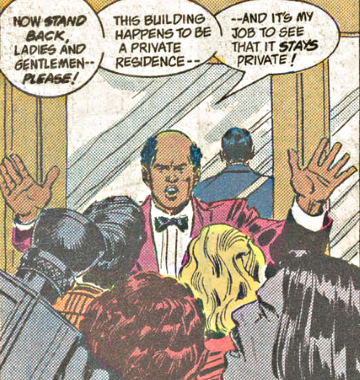 Back in the 70s and 80s, the doorman at 344 Clinton St. (Clark Kent’s apartment building) was a minor recurring character in the Superman titles. He was named Frank. He was never a major player, but his recurring presence added an element of verisimilitude that made Metropolis seem like a real place. But then, when the franchise was revamped in 1986, Frank was dropped. Even on the occasions when a doorman was seen, it wasn’t him. I contend that this is a shame. What I’m here to address, however, is the matter of Frank’s name. On the Internet, one can find him listed as Frank Morris or as Frank Johnson. Well how did the Internet mess that up? Well, it’s a mistake that comes from the comics. For a long time Frank was never given a surname. The earliest I can find of him having one is Superman #360, which was June 1981. He was Frank Morris there. It was a single off-hand reference in a story that wasn’t even about Frank. That was upended by Superman Family #215 (February 1982) in which Frank gives his full name as Franklin Pierce Jackson. That story is actually about Frank reveals that he’s a retired baseball player who was keeping his identity quiet for personal reasons. So maybe he was using Frank Morris as an alias? Well, maybe, but we only ever learned the Morris surname from a narrative caption, not a character in the story, so you think it’d be a fact given from an omniscient viewpoint. No, clearly Morris was never an alias, it was just that the writer of the Superman Family story didn’t know about the Morris naming. The latter story even has Clark explicitly note that he’d never bothered to learn Frank’s name. Anyway, the Jackson name is the one that stuck (It was used in Superman #413 in 1985, for example). So I’d say Jackson is pretty clearly the one that counts. So why did they get rid of a nice guy like Frank? Well, I have my suspicions, which I can not prove, that maybe it was an overcorrection for fear of being perceived as racist. “The one black guy in here is the doorman?” they might have thought. Well, sure. If Frank Jackson was the only representative of black people in the franchise, I’d agree that was unfortunate. But I’d also say that the solution isn’t to cut Frank out, it’s to add more roles for black people (and that is better in the books now than it was back in Frank’s day). After all, I don’t think there’s shame in being a doorman. Working class people deserve to be represented in stories as well as anyone else. I for one, would be happy to see Frank back at his post. Also, it’s worth noting that the era that ignored Frank Jackson was also the era that introduced Franklin Stern as the publisher of the Daily Planet. I’m not going to pretend I know why, but it seems like the name “Franklin” was very popular for token black characters. I’d guess it’s a name that they thought sounded black, but not so black as to scare anybody. You had Franklin from Peanuts, and Roosevelt Franklin from Sesame Street, and the latter led to Franklin Delano Bluth. Anyway, Superman has outdone them all by having two Black Franklins. Take that, everybody else.